1. Saffron. Saffron travels the world with her family. Although she is rather good at packing and quite excellent with tourist guides, she always seems to get into tricky situations. In this book she dodges traffic in Buenos Aires, eats escargot in France and gets lost in the cha... read full description below. Victoria M. Azaro was born and raised in Buenos Aires, Argentina where she developed a passion for the Fashion and the Fine Arts world. Victoria holds a Masters of Fine Arts and a Major in Fashion Design. She has studied and worked in many places around the world; but it wasn't until her first son was born that she started writing and illustrating for children. She published her first book Saffron in 2009, followed by Saffron, I have everything under control in 2010; and Saffron , so quite excellent in 2012. Saffron was awarded the prestigious White Ravens 2010 as well as being on the Storylines Notable Junior Fiction list for 2010. 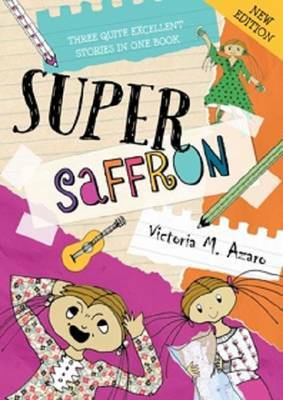 The Saffron series is still growing with Saffron having a monthly column in a New Zealand Children's magazine. Victoria now lives in Auckland, with her husband and their three children and she spends every free minute of the day writing and illustrating.